Many of us have had the unfortunate experience of going to a noisy restaurant and having our meal almost ruined by the loud environment. Many times the owners/managers aren’t even aware of how loud their restaurant really is, mostly from being accustomed to working inside. Customers, on the other hand, do notice and it can affect your business in more ways than you think. According to a recent Zagat survey, noise was the number two complaint among diners. This is right after bad service being the number one complaint. Consumer Reports survey of almost 50,000 readers also reported that one in every four dining experiences warranted a noise complaint. Conversation is one of the most important things lost when noise becomes a problem. Restaurant Briefing reported that on average, customers have noted noise levels of 80 decibels or higher in restaurants. Noises that go above 60 decibels (the average level of two people chatting) can disrupt conversation and make it harder to enjoy your meal. Customers aren’t the only people affected by noise problems. Sometimes employers forget or aren’t aware of the detrimental effects of loud noises. Occupational Health and Safety Administration (OSHA) monitors volume to protect employees from environments that could cause hearing loss over time. OSHA’s standards include a maximum noise level of 90 decibels (the equivalent of the average lawn mower) per every 8 hours and 95 decibels per every 4 hours. Oxford University experimental psychology professor Charles Spence mentioned that noise levels in many restaurants go around 100 decibels. This is like dining next to a tractor or hand drill. Imagine having a conversation like that? Is Taste Affected by Noise? The Food Quality and Preference science journal published a 2010 study that showed participants could perceive saltiness and sweetness much better when eating with quiet or no background noise. On the other hand, participants that ate the same food but with loud background noise could not perceive tastes as well as the other participants. This suggests the taste of the food itself can be altered just from noise. Sound can be a positive thing to use in a restaurant and it can be a way to create a nice background for people to enjoy their food. Of course, this is only achievable if used in the right way. University of Manchester had a study in 2012 that found people enjoyed their food more when it was accompanied with background noise, like soft music, while participants who ate with 80-decibel white noise in the background reported dulled flavor perception. We have had many restaurant owners and managers become clients, using our soundproof curtain tracks to divide restaurant space and create modular dining rooms. These may be retracted when needed, and provide a great way to segment the restaurant from noisy parties. 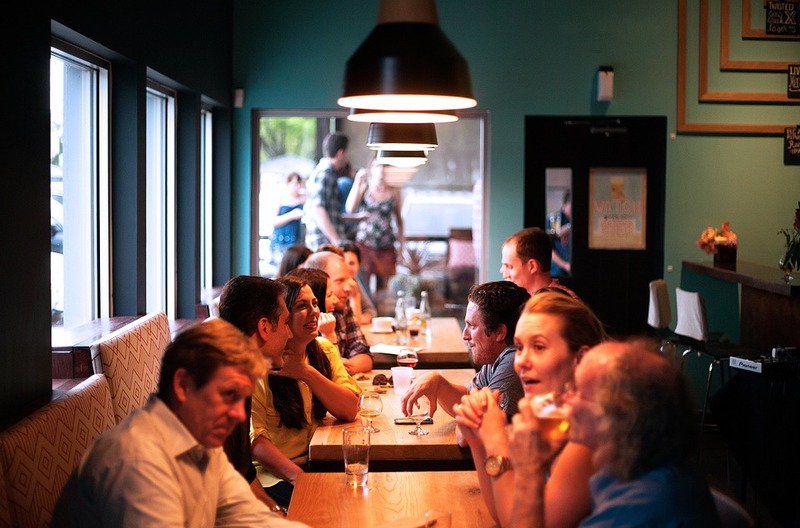 So there are several obvious reasons why you should watch out for loud noises and to make sure, if you’re the manager, that the restaurant stays at a noise level appropriate for conversation. We hope this was helpful whether you’re a restaurant owner or a curious reader, and if you have any more questions don’t hesitate to reach out! This entry was posted in Soundproofing. Bookmark the permalink.